In the lands of the Bisclavret, along the banks of the Skirfane River dwell a minor house known as the Repense -- a diminishing bat nobility reigning from their observatory towers over a domain populated primarily by mice. Among the Repense nobility, it is a long-standing tradition to study the heavens, and to discern portents amongst the stars and wandering bodies, and thus to determine the best way to go about one's life. Because of their dedication to the study of the stars, House Repense has produced the most comprehensive and accurate star atlases to be found in all Calabria. Whether one's interest is in divination or navigation by the stars, no better star chart will be found than one from the star-gazing bats and their mouse assistants. There are far too many stars for any one person to know them all by name (though some Repense do a commendable job of knowing all the brightest ones). Rather, they are grouped together in groups called constellations. It is imagined that these grouping of stars, if connected together, form crude images in the heavens. Some are much easier to find than others, owing to especially bright stars, or distinctive groupings. Within Calabria, there is no absolute standard as to how the stars are to be seen -- and even if the general names are accepted, there is a tendency to exercise some discretion in how to depict the constellations. For example, "The King" in Bisclavret lands will most assuredly be a wolf. A star atlas crafted in Doloreaux lands -- if it even follows the Repense naming conventions at all -- will portray a boar seated on the throne. Throughout the night, the stars seem to rotate against the black dome of the sky. Exactly which constellations are visible in the sky will vary depending upon the time of year and the latitude of the observer. As the sun makes its progression along the Plane of the Ecliptic, those constellations near its position will not be visible -- because they would only be in the sky during the daytime, when stars cannot be seen! Also, those constellations closest to the south pole are not visible in northern Calabria -- though Repense charts still show some of them, thanks to observations gained from forays into southern oceans. Twelve constellations lie along an imaginary line in the sky that describes the Plane of the Ecliptic, along which the "wandering bodies" (planets) and the sun move. These constellations are especially significant to the Repense for purposes of divination, and considerable importance is placed upon what constellation the sun was passing through at the time of one's birth. 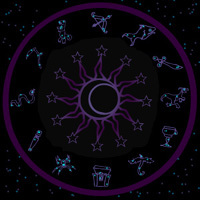 The twelve constellations of the Zodiac consist of (Northern Hemisphere) the Fish, the Sword, the Destrier, the Chalice, the Natheireun, the Coffer, and (Southern Hemisphere) the Spider, the Scepter, the Serpent, the Scythe, the Comhach, the Bow. St. Bragnaine, the Mouse Star: messenger of the heavens. St. Wynne, the Doe Star: water-bearer of the heavens. St. Weylyn, the Wolf Star: huntsman of the heavens. St. Trahern, the Bear Star: smith of the heavens. St. Condan, the Cougar Star: architect and artist of the heavens. Alas, the Axis Star is not visible from positions in the southern hemisphere. The end of the chain includes Azzis, the Axis Star, also known as the North Star. This cluster of six stars is easily located by novice stargazers, and the two stars that compose the ring can be used to find Azzis by following the line they form. The Wyrm King and Wyrm Queen are two clusters of stars close to the equator (but still mostly in the northern hemisphere) that look very like each other, and can be confusing to novice stargazers. The Wyrm King is located near the Coffer, whereas the Wyrm Queen's head points to the Bow. In myth, wyrms are fire-breathing reptiles, not to be confused with the dragons of Zhongguo (though that is not to say that no one ever does). The Knight ("Cuirassier") is located far north, and the stars that compose the main "square" of its torso are easily picked out. In illuminated star atlases, the species of the Knight varies greatly, depending upon the region in which the atlas was made (and its intended audience), but the Repense depict this as a horse of Avoirdupois, driving off the serpentine Daemon ("Naga"), the Sea Monster ("Kraken"), and the Great Beast. Crossing the "Spilled Wine" is the constellation of Riddock's Tower. Originally, the Repense imagined this tower to be a celestial echo of one of their own astrological towers, and the "Spilled Wine" here a stellar companion to the River Skirfane. In modern times the tower has been renamed to honor their Bisclavret masters. Watching the exploits of the Knight are the Lady and Helloise. Originally, these constellations represented the old goddesses: Reina and Adriene, respectively. (Reina was Goddess of the Day, and Queen of the Gods, whereas Adriene was her charming but subversive sister Adriene, Goddess of the Night.) With the advent of the worship of S'allumer, star atlases replace Adriene with a depiction of Helloise holding a child in her arms, and Reina with a noblewoman (changing her scepter into a small telescope). Lancelin and Ancelin in myth were brother and sister mice who were gifted with legendary good looks, and were taken to the heavens to serve the gods. Choosing them on the basis of good looks, however, was not the best of decisions. Lancelin, tasked with being cupbearer to the gods, spilled the Ever-Full Chalice. The constellation of the Chalice appears to be upended to anyone viewing it while looking northward, as held by Lancelin (the Cupbearer), with the misty expanse of the "Spilled Wine" coming forth from it. Ancelin, the Handmaid, is on the opposite end of the sky, forever tasked with cleaning up the mess, lest it engulf the entire heavens. In the modern interpretation, Ancelin and Lancelin are servants of Heaven, though Lancelin's failure and Ancelin's diligence are given a moralistic spin. The Hero, depicted as a badger woodsman of House Blaireu, takes the Sword in hand, doing battle against the Giant and his Mastiff. In the earliest star atlases, this wasn't a Hero at all, but rather a constellation known as the Herald, depicted as a mouse holding a horn. Its close proximity to the Sword, combined with political reasons, prompted the transformation. The core stars comprising the "Giant" don't really describe a figure large enough to warrant its name. However, in many star atlases, the "Giant" is depicted in such a way as to engulf several nearby constellations, and to incorporate a number of fainter stars, giving it a size more worthy in its reputation. In either case, the three stars comprising the Giant's Belt are easily picked out, making this a commonly known constellation. In the greater Giant constellation, the Destrier is held aloft in the Giant's left arm, with the Vixen held in his right. (Some of the stars comprising his legs overlap those of the Unicorn.) Running ahead of the Giant is his hunting beast, the Mastiff. The Giant is portrayed as a huge man with features very reminiscent of elephants of Yindu, though possessing enormous tusks and a hairy body. This image is inspired by wild old sailors' tales of an "isle of demons" in the frigid northern waters, populated by man-eating monsters described with such features. Perhaps more accurately termed an "aerobat," this constellation portrays a bat performer gleefully soaring through the air to entertain the host of heaven (or the old gods, in pagan times). Most if not all of the constellations in the southern hemisphere are visible from Calabria. Those far south enough not to be visible from the towers of the Repense are known only thanks to journeys into the southern seas, and careful measurements taken by astronomers there. Unfortunately, just as the southernmost constellations are not visible in the north, so the northernmost constellations are not visible in the south, including Azzis, the Axis Star. The southern hemisphere lacks any equivalent South Star, or even one sufficiently close to serve as an estimate. There is no "Southern Star," but for sailors who travel the southern seas, there are two constellations not visible in the northern hemisphere that help to find which way true south is. When it is visible (which is only about half of the year in many latitudes) a ring of eight bright and closely clustered stars can be seen very close to -- but not quite at -- the southern axis. Religious-minded cartographers portray this constellation as a perfect circle with the octagram of the S'allumer faith inscribed within it, though the actual cluster is somewhat irregular in shape. Another constellation that serves as a sort of compass in the southern hemisphere is Gemma, the Jewel. The two stars that form the vertical axis of this "diamond" make a line that points due south; it is roughly opposite the Octagon, and hence is useful as a guide to sailors during the months when the Octagon is not visible. This is a relatively new addition to the star atlases, as in ancient charts, these stars were not considered bright enough (positioned as they are against the hazy stream of the Spilled Wine) to warrant a constellation of their own. Many star atlases made outside Repense lands don't even bother to include this one, but it's officially portrayed -- in a tip of the hat to their religious and political masters -- as a wolf holding a calendar sword, and wearing a tartan of Bisclavret nobility. The Tuntre is an allusion to an old tradition that actually started with the old Phelan (before the emergence of the Bisclavret): when the first master of a farm died, he was buried in the yard of the homestead, and a rowan tree was planted over his grave. This tree was known as a "tuntre," and the farmer's descendants would make prayers at this tree, believing that it held the spirit of their ancestor -- who would guard the farmstead and bless the crops. Although the original pagan connotations have gone away, the practice of planting a single "yard tree" next to the homestead is still followed -- without, necessarily, anyone buried underneath it. This is a cluster of seven stars located close to the Plane of the Ecliptic, often left out as a constellation from star atlases. When it is depicted, the Septagon sometimes is shown with a seven-pointed star inscribed upon it, making it more properly termed a Septagram. This constellation has sinister connotations in divination, borrowing from the lore of Septagus, Lord of Misrule, from the Doloreaux. The Repense see these two constellations, each flanking the "sinister" section of the Ecliptic Plane, as representing a sort of opposition -- the refinement and education represented by the Wizard (depicted traditionally as a ferret for unknown reasons) compared to the noble savagery of the Hunter (depicted traditionally as a cheetah spearman from Akoma). Syphus the Angel is seen by the Repense as a messenger of the Light, who brings omens to mortals in cryptic and riddling ways, so that they might be enlightened only through diligent study and reasoning. In ancient times, before the rise of the Rinaldi and the faith of S'allumer, Syphus was the God of Riddles to the Repense, responsible for arranging the stars in the heavens, and directing the movements of the planets, for the purpose of hiding secrets that might be found only by those diligent enough -- and thus worthy -- to find them. The meta-constellation of the King is composed of the easily found Throne (easy because the main square is composed of four fairly bright stars), the Scepter (a zodiac constellation on the Ecliptic), the Crown, and the Tail-Brush. Before the King, the Spider weaves gold on a magical Spinning Wheel. The identity of the King as portrayed in star atlases varies greatly depending on who is making the chart. Originally, in the oldest Repense star atlases, there was a bat god (Audric, King of the Gods) on the throne, with some of the stars of the Serpent serving for wings. Behind the throne was the constellation of Padgett, the Page, a mouse attendant. With the rise of the Rinaldi and their conquest of Repense lands, the Page became a Tail-Brush for a fox king sitting on the throne. When the Rinaldi began to decline, and the Repense had new masters in the Bisclavret, the King became a wolf. Sometimes thematically joined with the Unicorn and Acrobat, these three constellations represent entertainers: the Fool (often shown as a very foppish fox jester playing a lute), the Juggler (shown as a monkey in courtier garb, with three of the stars being three golden balls he juggles), and the Dancer (typically a Screeberagh servant, or else an Akoman cheetah slave). This constellation is traditionally depicted as a tuft-earred desert lynx. The Desert Prince hefts an enormous curved blade described by the companion constellation of the Scimitar. Of course, the same stars shine in the night sky over distant Zhongguo as over Calabria, though they are known by different names. They still divide up the stars into constellations, though different ones. They recognize the utility of the North Star, and to them the Key is known as the "Six Northern Stars." However, they organize the heavens differently, dividing them up into four quarters known as Palaces, and with twenty-eight small constellations (seven for each Palace) that are known as "Moon Lodges". For purposes of divination, the positions of the planets and stars are important, but so too is that of the moon. Its position is measured by determining which "Moon Lodge" constellation it is closest to. Seven Moon Lodges join together to form a larger meta-constellation, each one associated with one of the Four Heavenly Guardians, of the Four Heavenly Palaces. Each Guardian is associated with a cardinal direction, a Daoist element, a color, and a season of the year. Each season, one of these Palaces is considered prominent in the heavens. A cardinal direction is associated with each Palace, based on which way the shaft of the Six Northern Stars is pointing when that Palace is prominent. The Black Tortoise is depicted as a strange sea creature that is part tortoise, part serpent. The Black Tortoise is associated with the Daoist element of Water, and with the season of winter. The Blue Dragon (sometimes Green Dragon) is associated with the Daoist element of Wood, and with the season of spring. The Red Phoenix is associated with the Daoist element of Fire, and with the season of summer. The White Tiger is associated with the Daoist element of Metal, and with the season of autumn. This is a less recognized "constellation," rarely shown on star atlases, that includes the North Star and the Six Northern Stars. The Qi-Ling has no Moon Lodges, Palace or season associated with it, but occupies the symbolic direction of the "center," and is associated with the remaining Daoist element of Earth. Ironclaw is copyright 1999-2007 Sanguine Productions, Limited. Used with permission; all rights reserved. Text and images on this page are copyright by T. Jordan "Greywolf" Peacock.